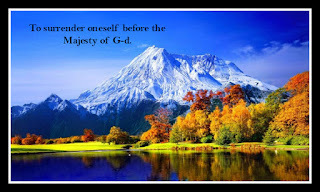 To surrender oneself before G-d. The Ultimate strength and courage to be a King. “You shall place upon yourself a King.” Deut. 17:15. In fact, the Torah designates every person as a king! Kol Yisroel Melachim Haim. Zohar. The role of every King, is to rule over his very own “small world”. To take responsibility of his/her own life in the ongoing war and struggle that starts from the moment of birth, of the good inclination over the evil and bad inclination. To gain ground, conquer, and take control over his “small city”. According to Jewish law, a king must be anointed by the special oil prepared by Moses. So the next natural question is, how can every person be considered a king? Every person was not anointed with this special miraculous oil? The rule is also, that the child of a king automatically takes over the throne from his father. Now, since each person is like an only child to our Father in heaven – G-d, the kingship is automatically passed to each and every person – the only child to G-d. However, how can anyone suggest each and every person is like an only child when in fact there are so many others in the world? The answer is that we are talking about G-d. Parents undoubtedly will have a very different type of mentality and emotions towards an only child or a child who is one of many. When it comes to G-d, the Holy Baal Shem Tov taught, “the love G-d has for every single person is infinitely greater than the love of an elderly couple who gave birth to an only child in their old age.” G-d in his infinite possibilities has that type of infinite love towards each person as if there was no one else but him. We are still not there yet explaining the special relationship each one of us has with G-d, being considered a King and an only child. Since G-d is forever as the verse says, “You and your years never end …”, He, is above and beyond the concept of time itself, how can anyone ever inherit anything from Him? G-d never ends and has no ending, to pass anything over to someone else? When it is written in the Torah the land of Israel is an inheritance for every Jew, the intention is not an inheritance from our forefathers Abraham, Isaac, and Jacob, but that every Jew no matter where he finds himself is granted a claim to the land, “an inheritance to the (entire) congregation of Jacob “, granted by G-d Himself. The inheritance, is our claim granted by the infinite G-d to each and every one. Those who study the wisdom of G-d in the Torah -- the most powerful energy of G-d granted to the universe, they are the true rulers and kings over this world. The study of Torah is not limited to any one group but as the Rambam writes, every Jew is obligated to study the Torah. Therefore it follows every person can study and actively become that king with the very real power to rule and conquer successfully their “small cities”. This awareness that every person is a King, grants every person in his spiritual service to G-d the determination and the very real courage to face and stand up to the struggles, temptations, and machinations of the evil inclination. This awareness and the strength it brings with it will never lead to arrogance because, he knows this is a strength exclusively granted by G-d and is not a power that is self-generated from inside himself. Jewish law says, even a King must stands like a servant, before G-d. Mindful that his title as a king is not about his own existence and identity, but that he is a messenger granted power by G-d, through the study and practice of the Torah and its commandments, that he carries with him the strength of the Torah - G-ds strength - the wisdom of G-d - to take on and stand firm before any challenge that he/she ultimately conquers his/her little city and succeeds to become the ruler and king over themselves. 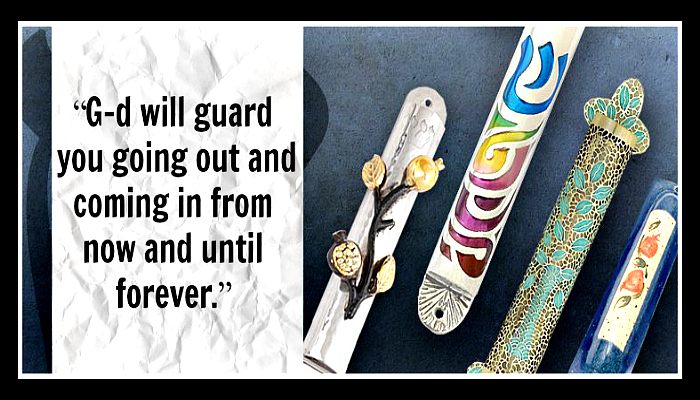 A KOSHER Mezuzah scroll is unbelievable protection. Invest in some for your own protection TODAY. 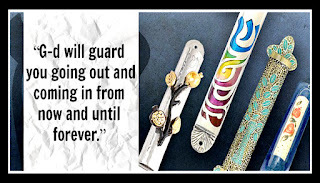 That is why even when a mezuzah is not up on a doorpost in the place that would fulfill the necessary requirements to fulfill the Mitzvah, the scroll of the mezuzah in itself, brings protection. Rabbi YY Schneerson always had a Mezuzah on his desk. Rabbi MM Schneerson - the Lubavitcher Rebbe recommended many times for people to do the same, and to place one in an appropriate covering next to a bed where people where having bad dreams. The foolishness of these people by adding inside the Mezuzah additional names of Angels is that it would appear from their actions the scroll isn’t enough or complete and is being manipulated from being a commandment to serve G-d and with the help of G-d, to the input of their own vanities, solely to serve their own purposes. This understanding, that the scroll and energy of the (mitzvah of) Mezuzah itself brings protection with it, sheds light on a story that took place with Rabbi YY Schneerson 1927, when he was brutalized and imprisoned in communist Russia for teaching Judaism. During the interrogation he was asked, if he realized where he was? Rabbi YY Schneerson answered. “Certainly. I am in place that is exempt from having a Mezuzah”. By mentioning and attaching the Mezuzah to those quarters albeit in a negative form, that alone, brought the protection of the Mezuzah for himself where he needed it badly. Maimonides writes: “A person must show great care in [the observance of the mitzvah of] mezuzah, because it is an obligation which is constantly incumbent upon everyone. [Through its observance,] whenever a person enters or leaves [the house], he will encounter the unity of the name of the Holy One, blessed be He, and remember his love for Him. Thus, he will awake from his sleep and his obsession with the vanities of time, and recognize that there is nothing which lasts for eternity except the knowledge of the Creator of the world. This will motivate him to regain full awareness and follow the paths of the upright. Whoever wears tefillin on his head and arm, wears tzitzit on his garment, and has a mezuzah on his entrance, can be assured that he will not sin, because he has many who will remind him. These are the angels, who will prevent him from sinning, as [Psalms 34:8] states: "The angel of God camps around those who fear Him and protects them. In these Hebrew words, Maimonides is emphasizing the uniqueness and exclusivity of the Mezuzah that unlike even Tefillin and Tzitzit, the actual scroll itself is a collaborator and assists in accomplishing the necessary results that this Mitzvah brings to the person who observes it. I have personally many many stories from Rabbi MM Schneerson how Mezuzot saved people from car accidents, death, being able to have children etc. A KOSHER mezuzah scroll is unbelievable protection. Invest in some for your own protection TODAY. Prayer is a two-way bridge that connects and perfects our souls. The words, Moses prayed “at that time” is not being precise. When exactly? That’s because, at whatever time a person feels the need to pray and attach him/herself to G-d, we learn from Moses, and emulate his example, even if it takes praying 505 prayers, no one would know better than Moses that prayer is the most powerful tool to turn to, “at that time”. 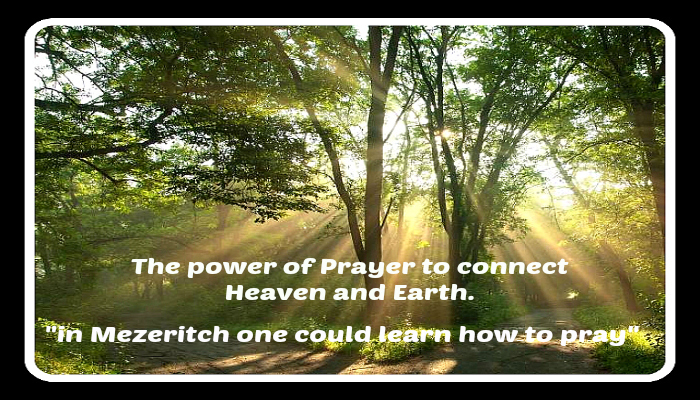 In Hebrew, the literal translation of the word for prayer actually means bonding and attachment. Therefore, the real objective in praying is not so much turning to the best source for answers and a relief from whatever the issue might be at that time, as much as it is a strengthening and renewal of one’s bond and attachment with G-d Almighty Himself. When the bond is tight and clear, the problems on their own disintegrate. During prayer especially when done in a synagogue the soul of a person can divest itself from any of the physical limitations of the body, it ascends to the Garden of Eden and strolls around the elevated and higher dimensions. After ones prayers when one must proceed with the obligations of the day, the physical world will once again place its influence and clutches on the soul. At the beginning of the book of Genesis, prayer is compared to a ladder, set on the ground with its top reaching into the heavens. 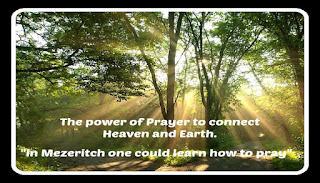 Prayer is the medium to connect “ground”, that part of the soul enclothed in our bodies and on earth, with “heaven” the other more important higher part of our souls, the part much larger than being able to descend into our lowly bodies and existence. Prayer is a two-way bridge that connects and perfects our souls. When a person puts him/herself into the words of the prayer as designed by the great mystical traditions, not only is the coarseness and physicality of the earth elevated and refined to a more translucent and purer form, the perspective of the heavens and the experience of G-dliness is drawn back down to the earthly level the person is praying from. When a person prays with the complete concentration necessary, every letter and every word, every thought and every spark of energy generated from the prayers, creates angels that serve as messengers who reach G-d. These exact messengers return, with the fruits of our directed prayers. When Rabbi Schneur Zalman of Liadi (1745-1812, founder of Chabad Chassidism) neared his twentieth year, he decided -- with the consent of his wife, Rebbetzin Sterna -- to travel to a center of Torah learning and service of G‑d. At that time Vilna and Mezeritch were the great Jewish capitals of Eastern Europe. Vilna was the seat of Rabbi Eliyahu, the famed Gaon of Vilna, and Mezeritch was the hometown of Rabbi DovBer (the "Maggid"), leader of the Chassidic movement. Related Rabbi Schneur Zalman: "I debated as to where I should go. I knew that in Vilna one was taught how to study, and in Mezeritch one could learn how to pray. To study I was somewhat able, but of prayer I knew very little. So I went to Mezeritch.